American-style red ales are possibly my favourite style at the moment. The rich, complex malt bill, often heavy in caramel, roasted and spicy notes, matched with the pith, pine and tropical fruit of hops is an irresistible combination. 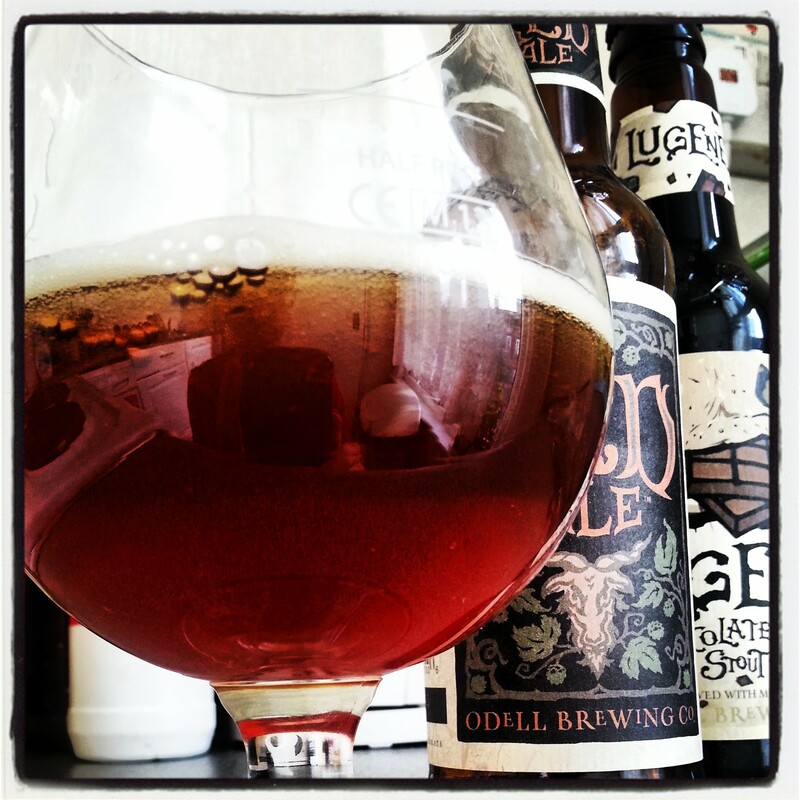 Odell’s Red Ale claims, or at least its label does, to have taken a new approach to American red ales. This is hard to agree with. It is still a fantastic beer, just not something terribly new or exciting. The one thing this beer does impress with is its colour. I’ve never seen a red ale this red. It glows like a traffic light, but instead of in scarlet, it does so in a rich, warming, burnished autumnal red. It’s almost as pretty as the label on the bottle, which, let’s face it, is very easy on the eye. Odell’s Red Ale, whilst boasting of ferocious dry hopping, is more of a study in malt, and this is evident from the aroma alone. Imagine a plate piled high with golden syrup cookies, with golden syrup poured over them, then set alight and sprinkled with chocolate shavings and vanilla. It’s an amazing aroma that brings a nostalgic half-smile to your face without you realising. You know, that time we set fire to those cookies. What a day. Anyway, what I’m trying to say here is that it has a complex, biscuity and syrupy nose. If you can bring yourself to stop smelling it for a second, you’ll find these aromas carry through pretty cleanly to the palate. Which is odd. Normally, a red ale is a heady muddle of flavours, but Odell’s has a clarity which is quite astounding. Those much-talked-of dry hops do make an appearance, adding piney, resinous stickiness to what is already red treacle in a glass, but not really providing the ‘kick’ that the goat-adorned label promises to provide. It’s certainly a dry finish, but the mouthfeel of the beer is so thick and oily that it really demands a firecracker hop barrage to even it out. There’s too much I like about Odell Red Ale to say that I’m disappointed by it, but I’m not as happy with it as I thought I would be. As all the other beers I’ve had of Odell’s have been hop-dominant, it seems weird to have two malt-driven beasts in a row. Nevertheless, I was excited to try their Lugene Chocolate Milk Stout, if, again, only because its label is so goddamn exquisite. Heaven knows how they managed to make a hairy old cow’s mush eating chocolate look so damn appealing. Lugene pours like flat cola; it’s one of those strong stouts that seems lively with a brown head of foam, but disappears in seconds, leaving you with a glass of thin crude oil. The aroma is dominated by the beer’s strength, a rambunctious 8.5%. Beyond the alcoholic, medicinal note, there isn’t much in the way of chocolate on the nose. There’s some, sure, but not as much as I would expect a ‘chocolate milk stout’ to have. There’s a bit of instant coffee and cocoa powder, but it all feels a little lacklustre. Not great omens for the taste, you might think, and you’d be right. What starts out warming, prickly sweet and cocoa-bitter, turns flat and limp quite quickly. You go back for more, but it never quite delivers. What Lugene is, bizarrely, is a session 8.5% chocolate stout. The alcohol, so present in the nose, is just a slightly medicinal aftertaste. The barely noticeable chocolate has perked up somewhat, but is ironically hampered by the overall sweetness of the beer. Whether this is due to the amount of unfermented lactose (this is still a milk stout after all) left in the finished product, or just a clumsy imbalance of flavours, is beyond my own detection. What I do know is that I have somehow found the two least impressive Odell beers I have ever tasted. I didn’t intend to write a blog post deriding one of my favourite American breweries, but here we are. I have had four or five absolutely stunning beers from Odell, and have just tasted two that have really left me underwhelmed. Do you agree? Have I just had a bad batch or have you had similar experiences with Odell beers? Let me know in the comments. 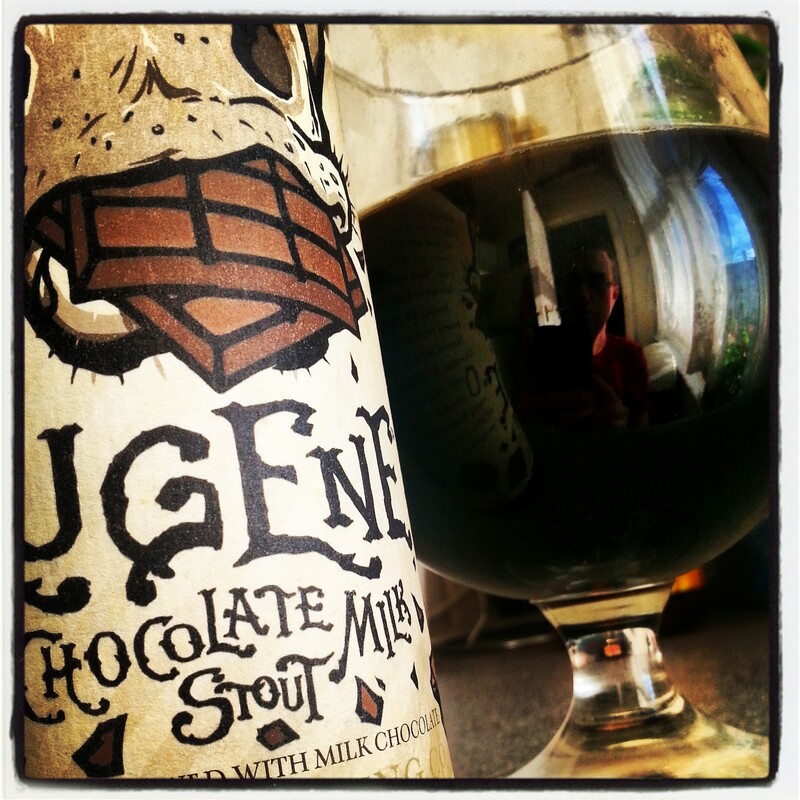 I loved the Lugene on draft but never had it in a bottle. I thought that although it was thick and alcohol-y, there were definitely some excellent flavors. Maybe try it on draft if you get the chance. I’d love to try it on draft, if some ever makes its way to the UK. Thanks for your thoughts! Bad luck, sirrah. I’m dubious of any milk stout over the 5% mark: as you say, an imbalance of flavours arising from the need to heavy-hop a stout (which should be subtle in hop and precision crafted in malt bill) in order to compensate for the ton of lactose. It wasn’t hopped in any serious way beyond bitterness, but yes, milk stouts should be lower in strength than this. Mackesons is one of the best I’ve had and that’s 2ish%. Bristol Beer Factory’s is king.